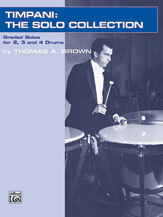 Written to include common challenges often encountered by today's timpanist. Meter changes, tuning changes and dynamic contrasts are carefully introduced throughout the collection. Includes individually graded works for two, three and four drums. A fourth section features five longer, challenging solos.